A diode's main purpose is to allow current flow in one direction and not the opposite. An explanation can be found here . The picture above right shows the pin arrangement of the bock. Pin numbers are indentified at the end of each row. The picture below shows a block with the cover removed. 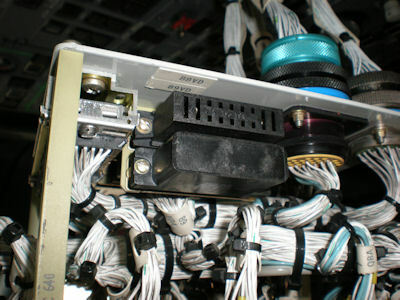 Two blocks (88VD and 89VD) mounted on the back of the fuel pump/valve control panel of an A300-600. This particular aircraft had a problem with the right center pump not indicating "off" with the switch relaxed (out or off position). It would test with the master dim/test switch. 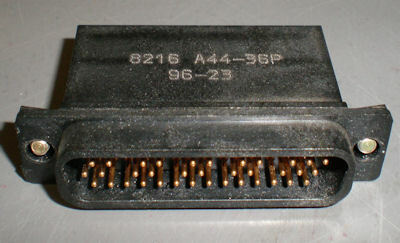 The problem was an open diode (pins 14 & 29) of block "89VD." With diode blocks "88VD" and "89VD" swapped the problem went to the left inboard pump light. After replacement of the bad block, all indications checked normal. Each block controls numerous functions. A complete panel (system) functional check should be run for all associated systems. Most are fairly simple in their operation. Two coils, one to open and one to close. An internal switch flips between contacts whenever the motor has reached full travel. As an example: The valve is open. The "close" contacts are ready to receive voltage to drive the actuator closed. When that voltage is present, the motor drives closed, when it reaches full travel, the "close" contacts separate which removes the voltage from the close coil (it keeps the motor from burning itself up). The motor is now closed with the "open" contacts ready to receive voltage to drive it open. Every aircraft manufacturer "brackets" pins between plug numbers. Pins will always be shown between plug numbers. For single plug components, it's no big deal. For a FCC or FMC rack, it is. In this case, the "Warning Lights Power #7" circuit breaker on a GIV was causing problems for the crew. Maintenance could not duplicate the C/B trip on the ground. 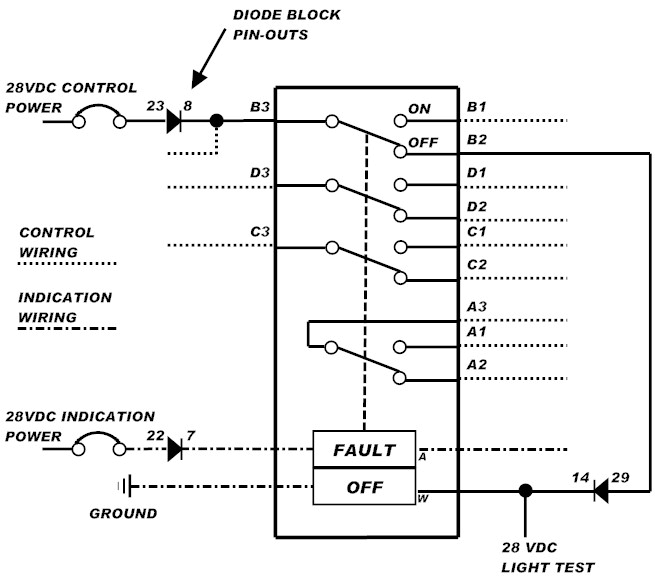 Current draw for this circuit is normally well below the 2-amp C/B's rating. 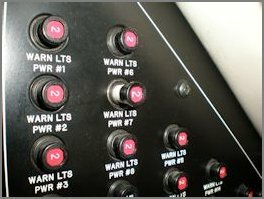 The warning lights power breakers installed on Gulfstreams power "many" sub-systems. To properly troubleshoot , "each" sub-system's current draw should be measured individually. Being that this is a "over current" issue, the first thought is to grab an Amp Clamp, which is a great tool for high draw items. One could be used, but the large clamp size is not feasible with small wires in cramped quarters. 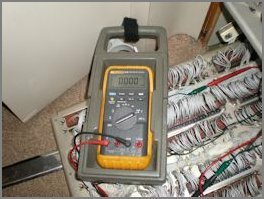 The best option for current measurement that is less than 10-amps is the VOM. The better Fluke models can measure current in this range. This is a "fused" measurement. Meter fuse ratings should be noted before use. When measuring current, the meter is "in the circuit." One test lead wire must be moved to the "A" test socket while the other remains in the "COM." 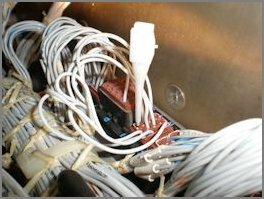 "All" wires are hot when testing amperage. Any bare test leads or wires should be protected from metal or skin. Jumper or test lead polarity plays a negligable part when testing current on aircraft. The main concern is the meter "value" for current not whether it's positive or negative. 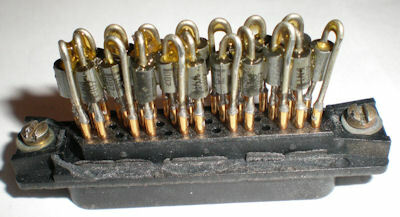 In this picture, one jumper is connected to a removed terminal block pin (main input from breaker), the other to a wire with a pin crimped on one end and inserted into the block. Nominal value for this particular problem was less than 12mA or .012-amps. 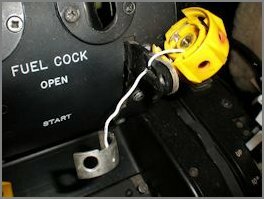 This aircraft's actual fault was found to be the right HP fuel lever light assembly. Static current draw was 0-amps, but when the #2 fire warning was tested, the reading jumped to 2.11-amps. This did not pop the breaker. When the assembly was wiggled, the breaker popped. After the unit was disassembled, it was found cracked internally. The positive bulb socket ring was touching the lever arm itself.